Many people with cancer are interested in what they can do to help themselves. 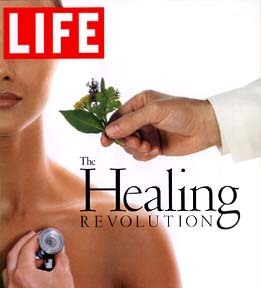 Some patients are so concerned about the possible toxicity from conventional therapy (chemotherapy or radiation) that they chose what they believe are more natural therapies (may of them unproven by current scientific standards) and avoid all conventional therapy (this would be called alternative therapy.) Perhaps better, many patients will proceed with standard therapy but also include other therapies that they believe will improve their health (this would be called complementary medicine). Before considering alternative medicine read the advice from the NIH (National Institute of Health or NCCAM), their section on cancer, the ASCO site, or the NCI advice or the NCI list of treatments, also the MD Anderson site. Also before loading up on herbals and vitamins read the nutrition/herbal section here particularly the links from: Sloan-Kettering Memorial, the Mayo Clinic and the American Cancer Society. There are many studies that show vitamin supplements can be harmful (go here). The main areas of interest include: body works, mind and spiritual and nutritional and herbals. For some of the treatments there may be scientific evidence for therapeutic efficacy while in other instances there is as yet limited or no research data. (The first major study of shark cartilage showed no value in cancer patients (J Clin Oncol 1998, 16:3649, and a large study on Echinacea showed no value, whereas studies from Germany show mistletoe or Iscador may prolong survival in cancer patients.) See the recent review article, article #2, article #3 the symposium issue in JAMA , issue in Cancer Control. For doctor miller's opinion go here. While this whole field is under investigation the advice below from Cassileth is both safe and useful go here.